Long lost Wind-up Dreams video recently unearthed! Good news in the Land of Wind-up Dreams! Over the past couple of weeks my studio has been undergoing some renovations in an effort to add a little extra space and added efficiency to my workspace. Wallpaper has been stripped, carpeting has been pulled up, and hardwood floors have been refinished and repaired. The original 85 year old floor beneath the dingy, water stained carpet was in especially dire need of care. Gouges, discoloration and damage galore! In places, the wood had rotted clear through, and several floorboards needed to be pried up and replaced with fresh strips of oak. Nowhere was this more true than at the far wall where the floor butts up to a cold stucco wall that doubles as a retaining wall for the small orchard at the southernmost tip of my property. There, right beneath the cabinet that holds all my most cherished figures and characters, the condition of the floor was at its worst, and it’s really a surprise that the floor hadn’t buckled under the weight of of the heavy shelves. Termites had long feasted on this wood, rendering the once majestic hardwood to resemble stale biscotti. No sooner had the cabinet been moved, two boards suddenly crumbled to dust, leaving a frightening hole as the base of the wall. And there, I made a thrilling discovery! Hidden in the dark and shrouded by a grey veil of webs was a small cardboard box. I snatched the box from its tomb and swiped away eight decades of dust and grime. Peeking back from the cardboard lid was the impish smile of a kewpie doll beneath a logo identifying the box as the “Property of DREAMSCOPE FILMS.” Inside was the unexpected: a round metal canister, containing a single reel of 16mm film. Whoa! Weird!!! How long had it been there?!?! Mystifying though the “why’s” may have been, I was far more interested to see what was on the film than to unravel the circumstances of it being misered away beneath the floorboards of the guest house. The film had unfortunately not fared well in the decades it had been locked away in its hidey-hole. 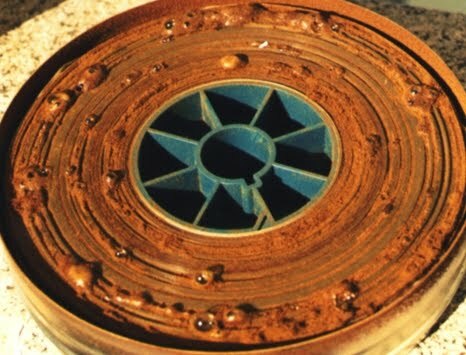 It had deteriorated badly with most of the tightly wound reel stuck together from one layer of film to the next beneath a bubbling brown ooze. The cells were almost impossibly fragile: cracked, warped, and cloaked by a hazy curtain of faded time. Still, with a pair of white gloves and the patient coaxing of a pair of medical grade tweezers, I was able to free the first few precious frames and spy ghostly images through the light passing through these prehistoric frames of celluloid. The canister was immediately sealed tight and placed in a climate controlled locking metal briefcase we keep on hand for these very situations. From there, the briefcase was whisked away to the Wind-up Dreams labs (didn’t know we had labs, did you? We do! We do!) where a team of preservationists—led by yours truly—were put to work restoring this precious reel of film to its original state. The effort was eye straining and shoulder burning, as the film was carefully unwound inch by inch, and snipped into individual frames which were placed one after the other in a sequence of labeled acid free envelopes. 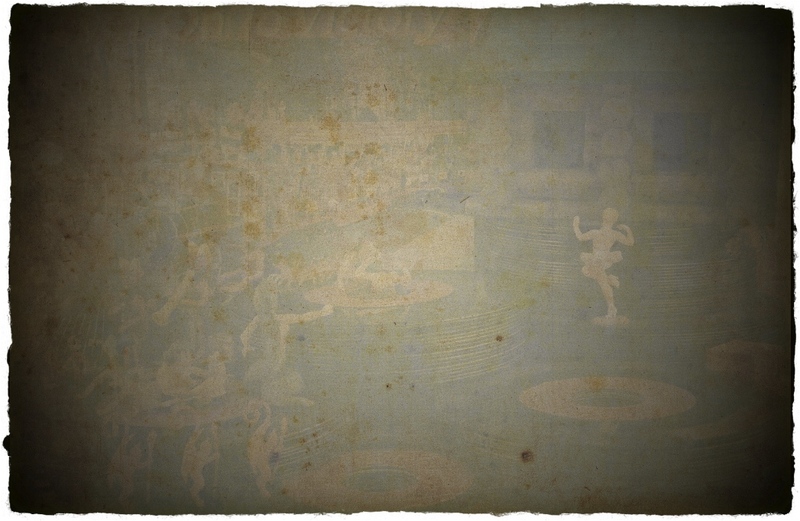 Some frames were entirely beyond repair, and the best offered no more than a hint about the image contained within. A sample of one of the better frames appears below. Note the deterioration at the edges, spots of decay, and the complete loss of color and detail. The final step was to scan and digitize each frame so that the entire 4 minute film could be resequenced on a computer and set to an appropriate score. Oh! And did I mention that the cardboard box had contained detailed notes from the original filmmaker? It did! The notes were penned longhand on stationary bearing the same DREAMSCOPE FILM logo that had been found on the box. While not at all helpful in identifying who had made the film or how it had come to be, the notes were explicit in laying out how the film was to be scored for viewing in a live setting, with a full orchestra and vocal accompaniment. These notes were absolutely crucial in providing audio accompaniment to the restoration! 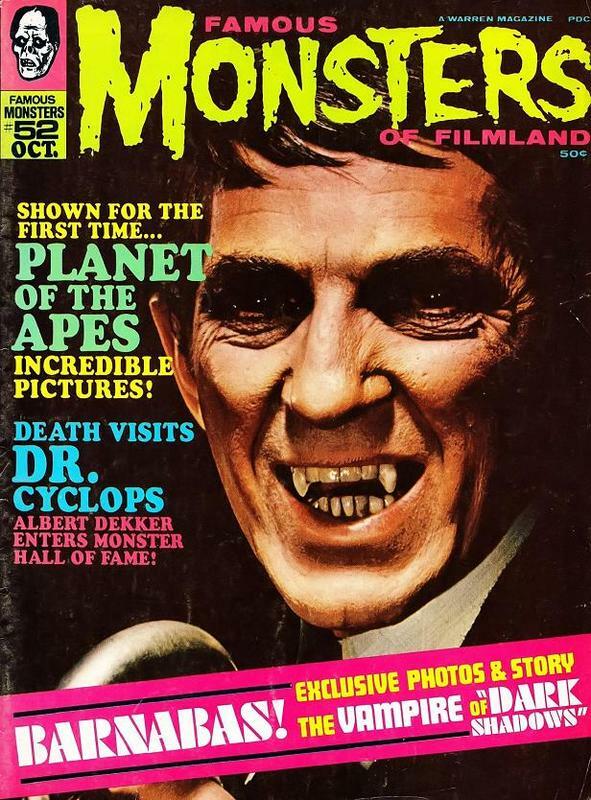 And now, without further adieu and for the first time in 85 years… Wind-up Dreams & Vinyl Nightmares is proud to bring you this lost footage!! Enjoy, and feel free to share with your friends! Yet another Oscar prediction blog! Best of the rest! With the 2012 Academy Awards now just hours away, there’s still time to squeeze in a few more of my Oscar picks. There won’t be time to analyze the nominees ad infinitum as I did in previous posts for Best Picture, Actor, Actress, and the always important awards Supporting Actor and Actress, so this installment will be a whirlwind of choice after choice after choice. Let’s get to cracking! Okay, as we’ve established throughout this series of posts, the mere fact that I did not actually see a film is no reason at all for me to hold back on offering an Oscar opinion. So, no, I did not see The Descendants. But consider this: Alexander Payne. Yes, a really great writer and a pretty fair director. I mean, he brought the world the deliciously black comedy Election, and for that he must always be revered. But since then: About Schmidt, Sideways, and a slice of Paris, je t’aime — and none of those were as good as Election. And I doubt that The Descendants is as good as Election. Therefore, he won’t win Best DIrector. Using the same logic, Martin Scorsese should not win either. Remember, Hugo is a nice film, but it doesn’t rate with Scorsese’s best. Of course, Scorsese has previously lost to an absolutely ridiculous array of fine-but-not-nearly-as-skilled directors (Kevin Costner, Robert Redford, Clint Eastwood, etc… notice a trend? ), so the Academy owes him big time. Giving him Oscars for The Departed and Hugo when Taxi Driver, Raging Bull, and Goodfellas were all shunned would be like giving The Rolling Stones a Grammy for any album released after Tattoo You. As much as I admire all of Scorsese’s work, I hope he doesn’t win. My pick… Michel Hazanavicius for The Artist! My pick… Woody Allen for Midnight In Paris! My pick… Even though I didn’t see it, but respecting his ability to write… Alexander Payne for The Descendants! I’d highly recommend any of these three films! Hey! What are you trying to pull? Incendies was nominated for an Academy Award last year! It’s not even eligible this year. You can’t do that! It’s not playing fair! You have to stick with the films that are actually e-l-i-g-b-l-e! Moron. Oh, sure, call me names, and yes I know that Incendies was made in 2010 and nominated in 2011. It lost Best Foreign Language Film to In A Better World, though at the time how many people in the US (outside of film critics and smart-minded festival goers) had had the opportunity to see either film? The Best Foreign Film competition runs about a year behind all the other categories, with great films eventually trickling onto our shores weeeeell after their initial domestic, native run. So I saw it in 2011, and feel totally vindicated in taking some liberties with this award, and hope I can persuade readers to add some very worthy films to their Netflix queue! Incendies was truly one of the best films of the year, regardless of language. It was well-written, filled with suspense, and benefited from extraordinary acting. While in a prior post I fictionally “awarded” Best Actress honors to Elena Anaya for The Skin I Live In. In all honesty, though, the most deserving non-nominee was Belgian actress Lubna Azabal, who delivered a scary-good performance as a Middle Eastern woman trapped by the circumstances of her surroundings, and forced to deal with the psychological torment of unspeakable demons. Directed with squirming-on-the-edge-of-your seat tension by Denis Villeneuve, it was one of my favorite films of the year. That’s it for my picks! Don’t forget to follow @johnpurlia tonight on Twitter for my reaction to the winner and losers! Yet another Oscar prediction blog! Best Actress! Welcome to the fifth in my series of Academy Award picks! In this installment we’ll wrap up the acting awards with my selection for Best Actress, or—as officially proclaimed by the Academy of Motion Picture Arts & Sciences—the award for “Best Performance by an Actress in a Leading Role.” Let’s hope this year’s casting call of nominees is as outstanding as the fancy title! I could not bring myself to see Albert Nobbs, which stars Glenn Close as a woman pretending to be a distinguished butler in Merry Olde Ireland. Nothing wrong with the premise, which has been done to great effect throughout the history of cinema. But in the trailers, Glenn Close just looked… creepy! Plus (and this is admittedly juvenile of me), I could not get beyond the pun in the film title and kept imagining Beavis and Butthead watching the film. Rightly or wrongly (and I’m sure many of you can come up with examples to the contrary), I’m of the general belief that Hollywood remakes of excellent foreign films seldom live up to the original. 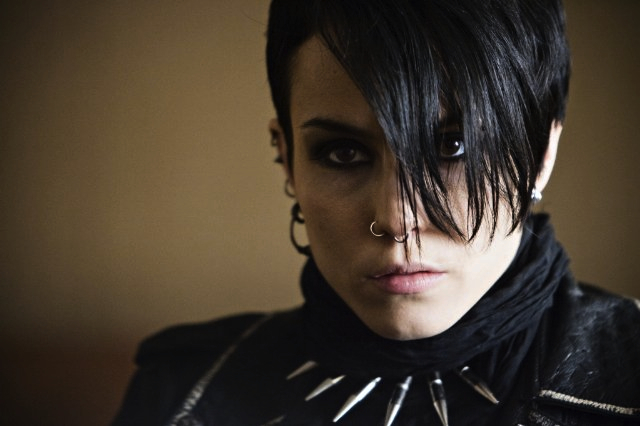 Having seen the 2009 Swedish version of Stieg Larsson’s novel, I already had an image in my mind of who should play Lisbeth Salander, that being Swedish actress Noomi Rapace, who was thoroughly well cast in the original. 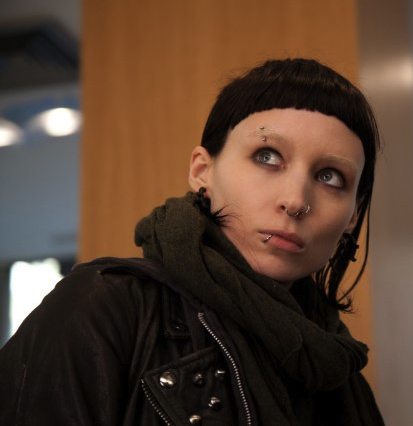 I hear Rooney Mara was fine in the remake, but apart from sharing a double-O in both their first names, Mara didn’t quite compare to Noomi Rapace. So did I really need to see the remake? No. And… I did not. Yes, Meryl Streep is one of our truly great actresses, but did I really want to sit through a film about Margaret Thatcher?!?!?! No! What kind of story can you cook up about the Prime Minister of England? Unless the movie revealed that Margaret Thatcher was secretly a vampire and ruled a Parliament of the Undead, I’m not interested. For that I would be rewarding Streep with an Oscar. With those three unseen performances out of the way we’re left with two shrug-worthy choices for Best Actress: Viola Davis and Michelle Williams. I know Viola Davis is the crowd favorite front runner, with legions of Oprah Book Club devotees raving about her performance as Aibileen Clark, but I thought she was seriously upstaged by Octavia Spencer in the very same film. Davis gave a very nice performance, but… Apart from significantly more screen time, was her performance was any more noteworthy than her previous nomination as Best Supporting Actress in Doubt? I give it a tilt of the head, a raised eyebrow, and a noncommittal smirk. Nice job Viola, but I didn’t think it was the best acting job of the year—even in a mainstream film. As for Michelle Williams, whose work I typically love, her portrayal of Marilyn Monroe was upstaged by… Marilyn Monroe! She was fine, period. Just… fine. But she wasn’t Marilyn Monroe in much the same way that Julia Ormond was not Audrey Hepburn in the remake of Sabrina. Some people and roles are just untouchable, and to convincingly play Marilyn Monroe is pretty much impossible. So my pick won’t be going to Michelle. Are you beginning to see my dilemma with this category? I have a list of nominees and no desire to rip open the envelope and tell you who has won! It’s like Best Supporting Actor all over again! This is why I’ll probably never be a presenter on an Oscar telecast. I’d stand there on stage in the Kodak Theater (by the way, what do we call the place now that Kodak has declared bankruptcy?) looking out at all those gowns and black tuxedos. I’d reach into my jacket pocket and pull out a wooden match. I’d strike that match against the windscreen of the microphone, and light the gilded winner’s envelope aflame, while the accountants from Pricewaterhouse Coopers looked on in horror. It is without shame that I include Kirsten Dunst in my list of nominees—mostly to buy time while the security guards begin squawking into walkie-talkies and scrambling from the wings. Dunst had received considerable Oscar buzz for her sedative-laden detached performance in Melancholia, so—after first announcing the wholly unexpected (and very well-deserving!) Azabal, the mainstream members of the Academy might just buy my alternate list as a last second change in the program. I don’t know; maybe the women on the original list had not paid their SAG dues or something. In truth, I thought Dunst’s performance was a bit wan and one dimensional. Love Kirsten Dunst, but I blame director Lars von Trier the Danish Duke of Cinematic Despair. In any case, I suspect the rumble of confusion might die down once I announce Miren and Winslet. The trained monkeys in the crowd know these names, and no doubt they will reward each announcement with respectful applause and a swell of building enthusiasm. The ceremony is now mine!! It matters not that few in the crowd saw any of these four films, nor witnessed the excellent performance from each one of my new nominees. Miren is an Oscar winner! Winslet is an Oscar winner! Dunst is the token up-and-comer! And Aza… Azaba… Azabalalal is the token foreigner to appease the people who see independent “art films” and make those of us in the crowd feel as if making movies isn’t really about making money! Yay! Here, as is my right was presenter, I would faux-fumble with the envelope. Breaths would hold tight. Face would lean forward. A billion TV eyes and ears would anxiously wait. The envelope rips, and out slides a crisp beige square of parchment. The theater would erupt in applause! The applause would lasts exactly 1.8 seconds. The audience would then realize that Helen Miren didn’t win. Kate Winslet didn’t win. Nor did Kirsten Dunst or that Lubna woman whose name they have already forgotten. And wasn’t Meryl Streep up for this award? Four people continue to stand and clap, one of whom is Pedro Almodóvar. He would be flanked by Antonio Banderas, Penélope Cruz, and Javier Bardem. Security would swarm the stage and drag me off into the gloom of back stage. Cameras would flash, microphones would stab, and into a police van I would be tossed. Later, under interrogation, I would sit handcuffed to the metal leg of a precinct desk, still clutching the crumpled winner’s parchment. I would try to explain how disappointing 2011 was for film, and express my frustration over the lack of a clear winner in the category of “Best Performance by an Actress in a Leading Role.” Sympathy would doubtlessly not be on my side, as it would be readily apparent that the detective and assembled staff are big fans of Adam Sandler, comedies based around marginal “holidays,” and anything with a sequel. It would be highly unlikely that my interrogators have heard of Elena Anaya. “She was the star of the latest Almodóvar film,” I would explain. “She was great!” Blank stares. “The Skin I Live In? Did you see it?” I would offer with some hope. “It was really good! Super intense, unsettling, and filmed like a piece of visual art. It really freaked me out!” Steely-eyed distrust and suspicion would rim the room. This would not go well. I would be completely flummoxed by this turn of events, as there would be no way to justify my actions without revealing key plot points that bolster my praise for Anaya’s performance as Best Actress! Frustrated by my predicament, my eyes would dot and dart about the desk, searching for anything that might get me out of this mess. Eureka! Okay, bear with me… If Glenn Close can be nominated for playing a not-so-lovely woman pretending to be a not-so-handsome man, why can’t Elena Anaya be nominated for playing a not-so-happy woman who was once actually a not-so-respectful man who has been forcibly transformed to be a totally gorgeous woman—and do so in a manner that we as the audience never see it coming?? There! I gave it all away, but it’s only in the reveal that you discover the disturbing psychological depth of Anaya’s performance in this richly twisted masterpiece of a film. Congratulations Elena Anaya for earning my un-nominated (and conveniently tongue-in-cheek) pick for Best Actress of 2011!! Yet another Oscar prediction blog! Best Actor! Our countdown to the 2012 Oscars continues! Don’t forget, the real winners (not half as deserving as my picks) will be announced Sunday, February 26th, via a world-wide television broadcast beginning at 4PM on the west coast. You can follow my snarky admiring comments by following me on Twitter @johnpurlia. Until then, read on as I continue to dissect the categories and offer ever so humble opinions on who should win, who should lose, and who has no business at all to forever benefit from the phrase “Academy Award Nominee” before their name in future trailers and marketing hype. Uh oh… looks like another category where my exposure to the nominees is limited to just a handful of films. However, as before, such a minor oversight won’t stop me from selecting a winner. After all, there are plenty of justifiable reasons to harshly judge an actor’s performance apart from actually seeing them on film. Recall from my insightful assessment of the Best Picture category that I was completely put off from seeing The Descendants because I didn’t like the way George Clooney ran in sandals in the trailer. Granted, it very well may be the case that the otherwise graceful Clooney was exhibiting tremendous acting chops to so convincingly flip-flop around the bend like a one-finned seal. But it made me not want to see the film, and therefore ranks his performance below that of his fellow nominees. I will give him credit, though, for his entertaining interview in a recent issue of Rolling Stone. I know Hollywood tailors their trailers (say that three times) for particular audiences and, evidentially, I wasn’t the target audience for The Descendants. A far, far better trailer—and one that zeroed in on my demographic like a sniper peering through a rifle sight—was the coming attraction reel for Tinker Tailor Soldier Spy. Now that was a movie I wanted to see! Hey, look! It’s Leo playing J. Edgar Hoover! Hey, look! It’s Leo playing Howard Hughes! Hey, look! It’s Tom Cruise playing… some guy that looks like Tom Cruise! No matter who Oldman plays—and he’s played some pretty big personalities (Sid Vicious, Lee Harvey Oswald, Beethoven)—he’s that character, and the audience disassociates the Movie Star from the role. Isn’t that’s what a Best Actor calibre performance is all about? Awesome performance; strong consideration for me to hand him a statue! Hey, look! It’s Brad Pitt playing a baseball GM! No, not Gary Oldman, because the Academy doesn’t yet “get” Gary Oldman. …Jean Dujardin, the star of The Artist. And the winner is… Jean Dujardin! Yes, despite Oldman’s riveting performance in Tinker Tailor Soldier Spy, my pick for Best Actor is Dujardin for his amazingly engaging portrayal of a cast aside silent film star in the year’s best film, The Artist. Warning! Fluffy, overused, tired film critic jargon on its way! Dujardin truly “lights up the screen,” showing all kinds of range “bringing his character to life.” Acting with only his face and body, though not at all handicapped by the lack of dialog, Dujardin succeeds in communicating the depth of his character to the audience, and plays off his fellow actors in a manner that makes each of them more successful in his or her role. It really is a marvelous piece of acting and should be recognized by the Academy as the A Number One Acting Achievement for 2011! Yet another Oscar prediction blog! Best Supporting Actress! Having put the award for Best Supporting Actor to rest in my previous post, we now move our attention to the other side of the aisle, Best Supporting Actress. There’s no time to waste, so let’s get right to the list of nominees! Melissa McCarthy was hilarious in the ever-so-raunchy Bridesmaids, but the Academy is none too kind to raunchy comedies (otherwise, Slapshot would have won a much deserved Oscar in 1978), so it is extremely unlikely that she will win. Should she win? Nah. Though outstanding in her role struggling through the perils of bad Brazilian food, I don’t believe the effort of convincingly relieving oneself atop a bejeweled sink in a dress designer’s lavatory requires quite the nuance of, say, a cast down housemaid during the Civil Rights Movement. But that’s just me. So, while convincingly funny, I can’t honestly say that her over-the-top performance is deserving of a little golden statue. So let’s talk about the nominated pair from The Help: Jessica Chastain and Octavia Spencer. Both were outstanding, but I give the nod to Spencer, who I felt brought more depth to her character than Chastain. And the winner is… Octavia Spencer! Spencer’s take on sassy take-no-gruff-from-no-one Minny Jackson was richly portrayed and injected her own sly little slice of raunch into the Oscar mix. Go Minny!! Stay tuned for the next installment of my 2012 Oscar picks as we move on to the awards for Best Actor and Actress!